Let’s just say I kind of like singing barbershop and being involved in this organisation…… just a little bit! Christchurch City Chorus has been preparing to travel to Las Vegas to represent NZ at the international Sweet Adelines Competition and compete against around 30 odd choruses from around the world (after winning the NZ national competition in 2015). 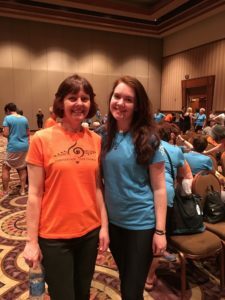 As an OOTM, I attended coaching weekends on average once a month from January to August (sneakily flew to Canada at the end of August) and then reunited with the ladies in Vegas on October 13th for the contest. My delightful Mama is also a member so I got to spend the 10 days in Vegas with her! Who could possibly wish for more! This was my second time at the annual international competition after competing with Greater Auckland Chorus in October of last year (see blog post here). It was a CRAZY 10 days. Most of us arrived on Thursday 13th and we then spent the next 6 days rehearsing for 5-6 hours a day. It was exhausting but exhilarating! We had our favourite coaches coming in to work with us – Darlene Rogers, Lynne Smith and Lea Beverly, along with short appearances from Ryan Heller, Jim + Renee and other celebrities! We had a joint show on the Tuesday night with Rönninge Chorus 0our directors have been good friends for many years and this joint concert has become a tradition. We performed our semi-finals and finals packages which was a great test run. It was a real pleasure and, of course, we were all blown away by Rönninge. 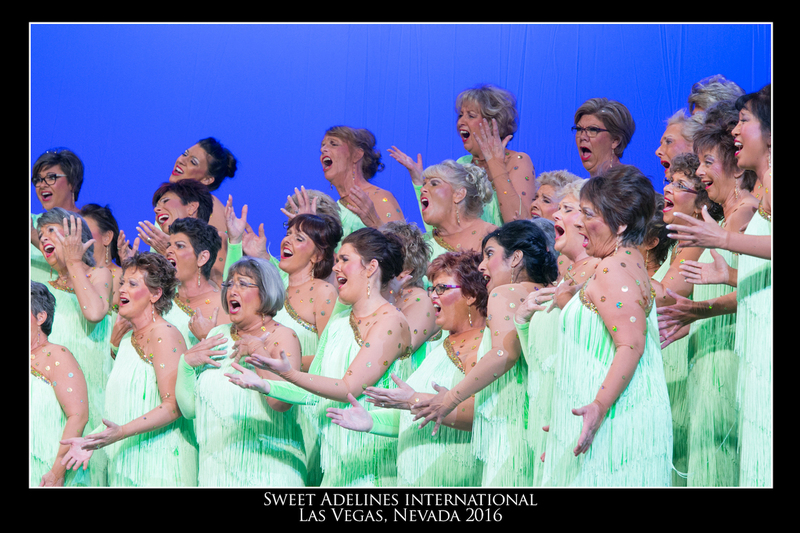 Long story short, semifinals day came along, we hit the stage in our green dresses (pictured below – spot me and my mother behind me to the left) and after a NERVE WRACKING announcement of the ten finalists, we were announced as contest #10 in the finals! Oh the agony of having to sit through the announcement of the nine other finalists and not knowing if ours would come next…. I don’t know if I have ever been in such a nervous state IN.MY.LIFE. 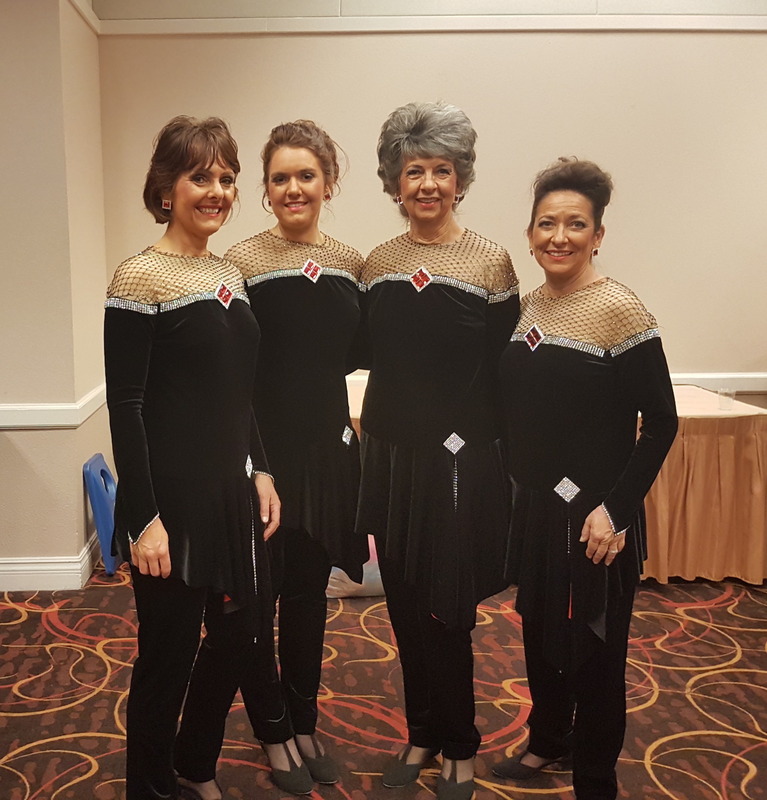 Friday was spent rehearsing for the finals and Saturday was another early morning to do our make-up, have breakfast, get our hair styled, warm-up, rehearse and get back on the stage! We were so pumped to get out there and perform the package that we’d been preparing for so long. And we nailed it. The reaction from the crowd was amazing. It was over so quickly and we couldn’t be any prouder of how it went. Another long story short, we received 5TH PLACE and the MOST ENTERTAINING CHORUS AWARD! Our director Virge put an unspeakable amount of time and effort into conceptualising the finals package and bringing it to life, it was honestly her baby, so it was such a treat for her to be able to go up and receive that award. We were super happy! It was the end of a magical time spent with the amazing ladies of CCC. The Nelson gang ready to perform in the Finals! **ADVICE for future competitors who will compete at the MGM Grand – the air is VERY DRY. There is air conditioning everywhere (and cigarette smoke near the casinos). We were advised to leave the air conditioning on in our rooms while we were away and turn it off when we get back, and keep it off at night. I went as far as to bring a humidifier with me to leave on 24/7 in our room. Sickness spread through our chorus far and wide unfortunately, I managed to avoid it myself ONLY JUST – by non-stop hydrating, taking multitudes of vitamins, washing my hands a lot, trying to still eat fruit and vegetables over the 10 days, and just generally looking after myself very carefully. Unfortunately a number of our chorus were struck down with a terrible flu. Some disturbingly effective steroids of some kind allowed them to still get on stage with us. Most important thing: look after yourself and keep those vocal cords MOIST! Previous Post: « Incredible week at the Canadian Rockies!